Often overshadowed by its gaudy neighbour, the Fairmont Nile City, the Conrad can rightly claim significance in Cairo. 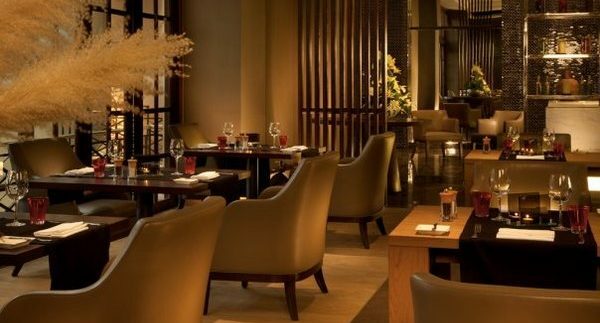 Two years ago, the hotel’s pan-Asian restaurant, Kamala, blew our socks off, so Oak Grill had much to live up to. Simple in design, the interior is dim and unspectacular, but spacious and comfortable, though the late-night racket from neighbouring bar, Stage One, intruded on the hushed atmosphere. An amuse bouche of one thin slice of smoked salmon sitting in a light anise dressing was a nice start to our intended feasting. The salmon was fresh, though the taste of anise was a shock to the palette. It also set up our starter nicely; cured organic salmon and marinated scallops (120LE). Served in a large plate, three scallops and three pieces of sashimi-style salmon came with a hefty trimming of light, cucumber-infused crème fraiche, a small helping of brunoised apples, orange fennel sauce, basil oil and a balsamic reduction. Each of the elements took position on the plate to create what was the closest amalgamation of art and food you’re likely to see in Cairo. Every one of these delicate ingredients contributed to the core of the dish in very different ways, with the orange fennel sauce being a particular highlight. From the small menu, we tried Oak Grill’s lamb dish (235LE). The eclectic entrée included one overcooked, but full-flavoured lamp chop and a serving of lamb shank pieces, topped with mashed potatoes and an indistinguishable cubed cheese. The shank pieces, though tender and full of flavour, were spoilt by the occasional wayward slither of fat. Looking like a shepherd’s pie, the mashed potato layer was bland in taste and got pretty cold, pretty fast. Accompanying the lamb were a serving of vegetables and a smooth dollop of carrot purée that complimented the meat perfectly. As the most expensive item on the menu, the 295LE tenderloin dish is also the most divisive; it comes with a generous ration of foie gras. The foie gras comes in scallop-shaped pieces – as is described in the menu – and if you can alleviate any visceral guilt, you’ll enjoy one of the best examples of the delicacy in this city. Cooked perfectly, the pieces are rich and full of flavour – almost as much as the tenderloin steak itself. Ordered at medium-rare, the thick piece of beef was unevenly grilled; one side was just past medium, while the other was closer to medium-well. It was a mistake that was quickly overlooked, though, as the meat was obviously of excellent quality and was as flavoursome as even the heartiest of steak-lovers would hope for. A cognac sauce adorned the plate, but had little say when up against the tenderloin; it was overpowered in taste. A small selection of desserts included banana and mocha cheesecake (38LE), vanilla bean crème brulèe (53LE) and, most interestingly, camembert cheese (35LE). Cheese lovers have forever been hard-done by in Cairo, but this simple dessert blew us away. A thin but wide oven-warmed wheel of camembert came with a spiced plum compote, small pieces of crispy bread and pesto. Although heavy and rich, and not the best note to end a three course meal on, the creamy cheese was nothing short of a marvel, especially when paired with the sharper taste of plum. Whoever was behind the grill at the time of our visit must have been having an off-day, but although the meats were over-done, Oak Grill‘s use of quality ingredients and employment of a simple menu should, and must, be applauded. Oak Grill offers a large selection of imported wines, starting at 600LE per bottle. Top quality cuts of meat.